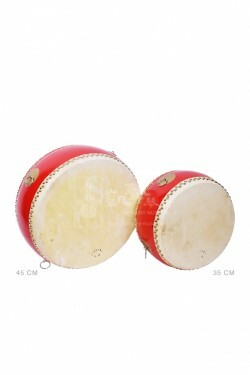 Chinese Flat Drums are now widely used in folk music ensembles, dances, carnivals and percussion performance groups. Measures 45 cm in diameter, this Flat Drum is made in Suzhou and its body is colored in a festive red. With a thick, intense tone and a pitch higher than the Flowerpot Drum, the Flat Drum is often seen in large percussion performances and parades that create a sense of unity and revitalization. The Flat Drum can be struck by drumsticks or tapped by hands. It can also be carried by hand or placed on a stand while performing.